Welcome home. Is it good to be back? Well, yes, I think so but it’s a bit weird to return to reality after six weeks away when the most pressing decision was really not very pressing at all. Where were we going to eat? Did we need to visit the wine shop (cellar door prices, in rand)? Anyone fancy a hike? Had the mother of the bridegroom (Pam V) found her outfit yet? Another visit to Tallulah’s then? Lunch at the market? Coffee almost anywhere? Wine tasting? Wine tram? Breakfast at Cafe Bon Bon? Cocktails at (Sir Richard Branson’s) Mont Rochelle? Lounging by the pool? Ready for another book? Golf? Gym? Wine? Football? Rugby? Outdoor concert? 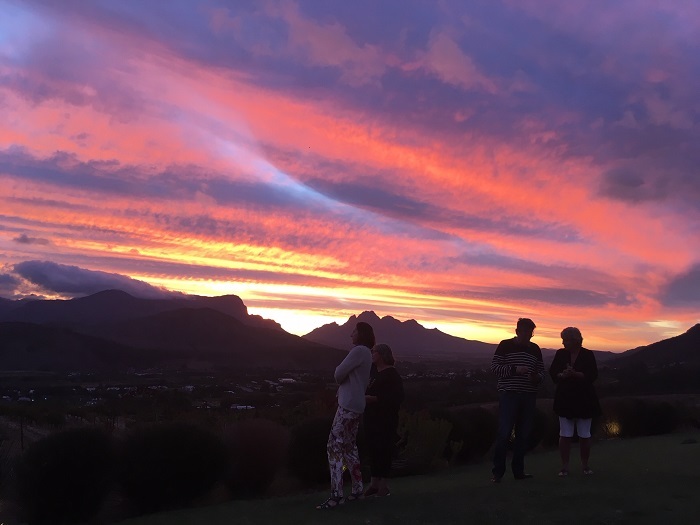 Farewell to Franschhoek. Sunset at Roca. It’s hardly surprising that coming home is a bit of a shock. I put my washing out but there was no one there to lob it in with theirs; it’s still lying around waiting for someone – that’ll be me I suppose – to put it in the machine. The unpacking isn’t straightforward because there’s a lot of it – thank you Emirates for not charging for the excess – and shows me that my drive towards minimalism is lacking in, well, frankly, drive. The floor is still rippling like the ocean wave – must ring the insurers – and the clock on the boiler is all to, well, not quite clock but what’s a road to ‘l’ between friends…. As you can probably tell, I’m tired and confused. Tired because, although there’s no jet lag involved from South Africa, it’s a long, long journey and confused because I’ve started listening to the parliamentary debates on Brexit and am now retreating, baffled, bewildered but definitely not bewitched. Think I’ll concentrate on tai chi, bridge and golf from now on. That’s more than enough for me and my remaining brain cell. Not just another digger. This is a Ditch Witch, irrigation layer supreme [Sue Marchant]. 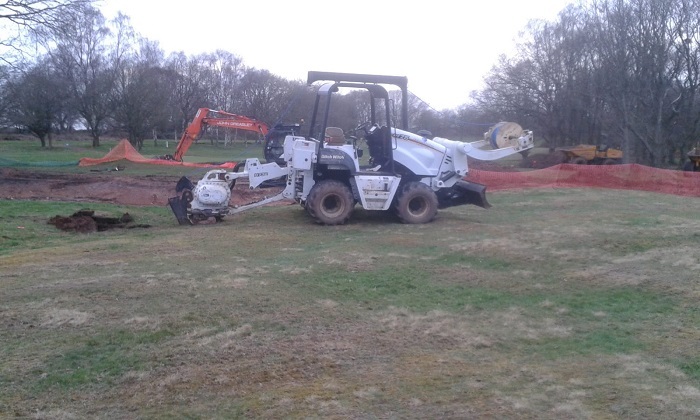 At first glance, from the clubhouse, all looks serene at Whittington Heath but there are diggers everywhere, gouging, lifting and laying, reshaping, adding bunkers. The winter eclectic’s been abandoned because the course is never the same, with tees and greens changing on a daily basis. Every round is an adventure but the general consensus is that it’ll be worth it, that another course of genuine quality will emerge from the chaos. And who could quibble when there’s a Ditch Witch about? Hope she’s staying on. We saw very few non-white golfers in South Africa – perhaps we were playing in the wrong places at the wrong times – but the latest missive from the ANNIKA Foundation featured a young woman who made my heart soar and made me think that the future’s in safe hands after all. She’s called Kaiyuree Moodley and represented South Africa at the Youth Olympics in Buenos Aires last year. She shared second place in the ANNIKA Invitational USA in January (after a three-way play-off) and although she won’t be 18 until next month, she sounds remarkably mature to me. 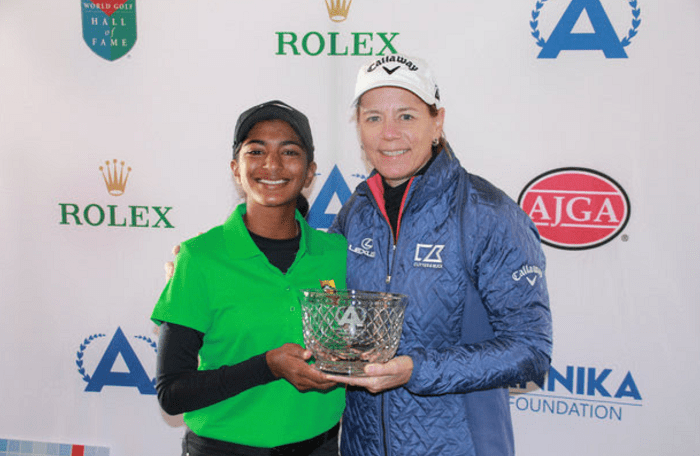 Kaiyuree Moodley, of South Africa, with Annika Sorenstam [ANNIKA Foundation]. There’s no sign of Kaiyuree’s name in the scores after yesterday’s first round of the Investec South African Women’s Open at Westlake Golf Club in Cape Town where the players were blown to blazes by the Cape’s notorious southeaster, with gusts of up to 50 kilometres an hour. The only two players to break par were Lina Boqvist of Sweden and Sarah Schober of Austria, who were on 71, one under. The event is co-sanctioned by the Sunshine Ladies Tour and the LET (Ladies European Tour) and familiar names well in contention include Lee-Anne Pace, Kelsey MacDonald, Michele Thomson, Lydia Hall, Annabel Dimmock, Carly Booth and Meghan McLaren, who’s just won in Australia, to mention just a few. 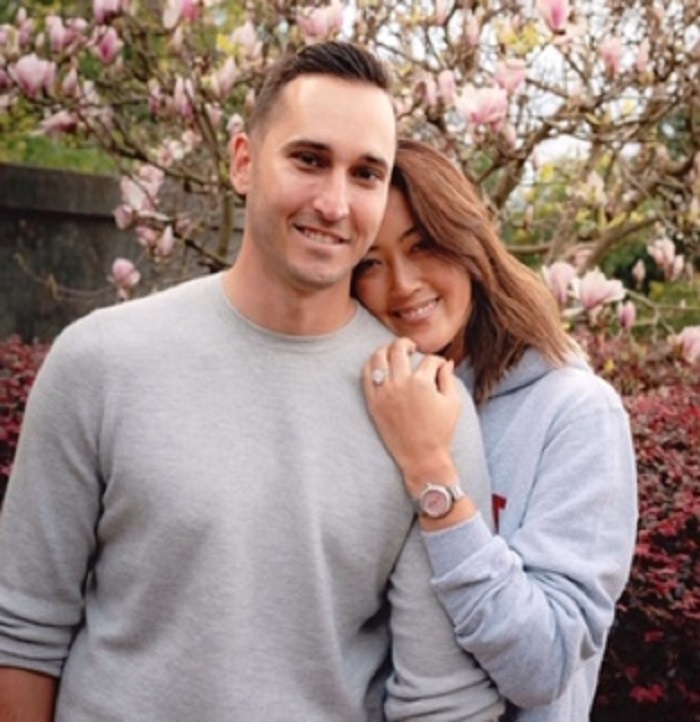 Finally, congratulations to Michelle Wie who’s just got engaged to Jonnie West, who works for the Golden State Warriors and is the son of Jerry West, a former NBA great (I quote, not being a big basketball fan but presumably Jonnie knows all about sporting celebrity and its pitfalls). One headline, rather inelegantly, read: “Michelle Wie off the market after getting engaged.” That aside, it’s lovely news and let’s hope they have a long and happy marriage.